—Queen Banana Bird, Donkey Kong Country 3: Dixie Kong's Double Trouble! 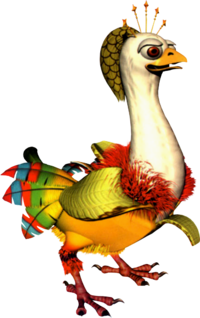 The Queen Banana Bird, also known as Banana Bird Queen and Banana Queen, is a giant multi-colored Banana Bird and the mother of all Banana Birds. She only appears in Donkey Kong Country 3: Dixie Kong's Double Trouble!. The Queen Banana Bird was sealed behind a barrier from Baron K. Roolenstein when he invaded the Northern Kremisphere. The Banana Birds were scattered in various parts of the island, including being trapped in Banana Bird Caves. The Queen Banana Bird can only be freed with the assistance of every Banana Bird, in which there are 15 in total (20 in the Game Boy Advance remake). She is located at the very top-left part of the Northern Kremisphere hub, which can only be accessed from the Gyrocopter. 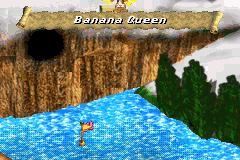 In the original release, the Queen Banana Bird is located behind some clouds. In the Game Boy Advance version, she is located on top of a mountain to the right of the Banana Bird Cave, K's Cache. Her barrier can be seen from the overworld. After Dixie and Kiddy Kong regather every Banana Bird, they must visit Wrinkly's Save Cave (or Wrinkly's Retreat in the Game Boy Advance re-release). From there, every Banana Bird flies them up to the Queen Banana Bird's location. When the Kongs return the Banana Birds to the Queen Banana Bird, they all sing an enchanted song that destroys her barrier. She thanks the Kongs, and gets revenge on Baron K. Roolenstein, who stole Funky's Hover Craft and drove it around the Northern Kremisphere. A brief chase scene occurs on it, where the Queen Banana Bird, with the Kongs on her back, chases Baron K. Roolenstein around the overworld. She eventually flies above K. Rool and drops a giant egg onto him. The Kongs free the Queen Banana Bird. K. Rool is trapped in an egg shell from the Queen Banana Bird. Banana Queen's location from the overworld. ↑ The Donkey Kong Country 3: Dixie Kong's Double Trouble Player's Guide, pages 10 & 128. ↑ The Donkey Kong Country 3: Dixie Kong's Double Trouble Player's Guide, page 127. This page was last edited on February 21, 2019, at 13:03.